Last summer I thru-hiked the Wonderland Trail in eight days during the shoulder season, and almost died. Maybe. Now, it would have made sense to write my trail report um, last summer, but then I lost my journal for months before I found it in the most unpredictable place (think envelope within a kitchen drawer). Luckily the journal has been found, so now I must dive into the details of this incredible journey that everyone should do. What the heck is the Wonderland Trail? 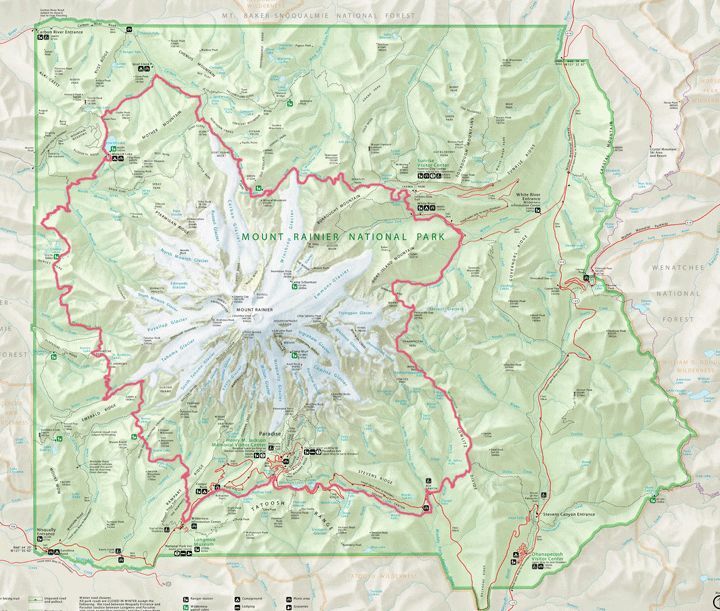 It is a very scenic, 93 mile trail that circumnavigates the majestic Mount Rainier. In the span of a week, you see every “face” of the mountain and get a peek around every corner of the National Park. See? And below is a picture of the Wonderland Trail’s elevation profile. What does it remind you of visually? To me it looks like a rollercoaster of thigh-burning hell. In fact, the trail challenges hikers with a strenuous 22,000 feet of elevation gain and loss. Now, what makes this place so special and treacherous trail worth the pain? Easy answer – everything. The Park (and mountain) is freakin’ gorgeous, and if you avoid the crowds at Paradise, you will find solitude in the backcountry. The Wonderland Trail in particular takes you through old-growth forests, right along the tongue of massive, breathtaking glaciers, through wildflower meadows, to the shores of alpine lakes and remote places where wildlife roam undisturbed. I fell in love with all the faces of Mount Rainier during my journey, and finished the Trail humbled by the unpredictable forces of nature. For more general info on the W.T., check out this resource. This blog post series will be written in a journal-like fashion due to the contents origin – a trail journal. I’ve never shared anything like this before, so bear with me as I try something new. The events that happened on Trail were sometimes dramatic, and I hope will translate well in this form of storytelling. Without rambling on too much, let’s get started. This morning Tina and I met outside of the Longmire WIC to solidify our trip itinerary. Tina is a leggy-woman with long blonde hair and a vibrant personality. We don’t really know each other but are thru-hiking together. Last week, while sitting on the floor of the Paradise Visitor Center, I thought, “I wish I knew someone interested in hiking the Wonderland Trail with me.” Within a minute, Tina – one of Amos’ coworkers – approached me and asked if I was interested in hiking the W.T. with her. We’d only met once before. I said yes, of course. Now I’m laying beside her in a two-person tent; life is funny that way. Today we hiked from Longmire to Nickel Creek with another one of Amos’ coworkers, Lindsey, and her friend Tyler. That’s a solid 14.6 miles with 3,000 ft of elevation gain. We started at 9am and made it to camp at 5 o’clock on the dot. A lot of uphill but tomorrow is supposed to be even more intense! And more beautiful. A third coworker of Amos, Claire, showed up around 7pm after we’d all eaten dinner. My dinner was delicious, and a first – mac and cheese with cajun seasoning. Mmhmm. It’s the little things. I just got back from a .2 mile hike to Nickel Creek to fill up my “dirty” bag to filter water in the morning. It’s fun to fall back into old patterns such as water management and the tedious process of filtering everything you drink. After the A.T., I remember being amazed by the convenience of tap water. You just turn a handle and then you have beautiful, purified water ready to go (ideally)! Now I’m enjoying the slow process of hauling two liters back to my site, and the mindful walk alone in the darkening forest. Earlier in the day, at the Box Canyon “care station,” I filled up my two gatorade bottles from the water fountain. I know why marmots become habituated – handouts are easy! Even if you enjoy the process, it feels against human nature to say “no” to a shortcut. Or maybe that’s just a problem for me and the marmots? Highlight of today: the fall colors as we walked on scree and the log footbridges. Just finished texting Amos – good service at Summerland camp – who knew?! Much better than his apartment. Today we hiked 10.9 miles from Nickel Creek to Summerland with 4,400′ of elevation gain! But the treacherous hills are worth it – Summerland is GORGEOUS! A whole new view of the mountain; the summit looks creamy and rounded like a scoop of vanilla ice cream. Or maybe I’m just hungry? The crew is gonna wake up at 6am to watch the sunrise. Hopefully I’ll sleep better tonight. Last night was horrible – I didn’t fully fall asleep until 4am to 7am. Bad dreams, too. One word – bears. I am always surprised by how quickly my hiker appetite comes back. I’ve been eating so much. 2 packs of salty ramen tonight and lots of snacks. Gotta’ lessen my pack weight! Body is sore as can be. Legs and feet are plain tired. Glutes and lower back are TENDER. Today’s hike was mostly uphill, steep and HOT. Shorts and a tank top and sun-beating-down on your neck kind of day. But I cannot complain! The weather app predicts our last two days will have scattered showers… Lots of wooden trail steps today, aka a staircase to hell, or heaven? The scenery was incredible. Once we broke treeline, after 2+ hours after leaving Nickel Creek, there were nonstop views of several mountain ranges. Highlight of today: my allergic reaction to watermelon algae?! I put some snow on the back of my neck to cool down and within 20 minutes I had a golf ball-sized welt. Having completely forgotten about the snow, I freaked out thinking I’d been bit by a bug and was going into anaphylactic shock or something. Once I remembered the snow, Lindsey let me wash my neck with her face soap. It went away soon after – thank god. I did not want to be medevaced out of the backcountry. Indian Bar was a nice lunch spot. A cute, old shelter at the bottom of a valley by a river/creek. Oh and I just could not reach the bear pole to hang my food from at camp… it was freakishly tall, and made me feel small. Tina was my savior. Yesterday wasn’t a bad hike. Only 2,300′ elevation gain, 9.5 miles, and most of it was downhill. I hiked with Lindsey mostly and we chatted about careers and other feminist things, which I’m always down to gab about. Our crew finished the day around 2:30pm when we made it to Sunrise. This was our departing point from Lindsey and Tyler – who’d now officially completed their thru-hike – woohoo! – and Claire. Tina and I hung out on the edge of the parking lot for a while, organizing all of our crap and going through our food caches. Like christmas! Bad news, the General Ranger who gave us our caches said bad weather is in the forecast and hinted that we might want to consider bailing… Also, I have a raw spot on my left foot and my left hip. In the parking lot, three older guys approached us with a go-pro and claimed they were making a documentary. They then filmed Tina and me awkwardly describing our 93 mile trip, which left them very impressed. Imagine a guy dressed as a hipster pirate, now imagine his friend in a cowboy shirt and a felt brim hat, and their other friend with rounded shades and a beanie with alpacas on it. Unbeknownst to the guys, we were undercover “parkies” so naturally the conversation drifted to them describing their weird, yearly ‘shrooms trip to Rainier and off trail scrambles. They seemed like Seattleites through and through. Hanging out with Tina and her childhood friend Allie, and the 2.5 slices of pizza they shared with me. And beer. Tina and I got fleas. Sand fleas. My ankles are covered in bites and I sent a pair of my socks home with Claire, in a plastic baggie of course. Hopefully they aren’t in our sleeping bags or this trip is about to get interesting! I also saw a squirrel eating a truffle, which is my dream come true! So much so that I scared the poor thing when I exclaimed, “OHMYGOD A SQUIRREL EATING A TRUFFLE!” It’s little paws dropped the mushroom body and scampered away from my girlish enthusiasm. After a moment of silence, I picked up the truffle and squished it in my fingers before tossing it at the squirrel. The squirrel then abandoned its fear and resumed eating. I was awe-struck. And I loved watching it lick its cute little paws when it was all done. We’re staying the night in the Mystic Ranger patrol cabin with Tina’s Backcountry Ranger-friend Shenan. I am writing from my sleeping bag in an upstairs loft. It’s raining now. Tonight we discussed a potential plan for bailing. Oh boy.